Elijah Boley and son Alphonse came to Mandan in 1877. Their arrival caused quite a stir then their wagon was pulled by horses, not oxen. 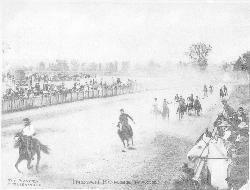 Elijah and Alphonse Boley were instrumental in the development of horse racing in the area, and events which evolved into and Mandan's rodeo. "Older than the Oldest Rodeo" Mandan's rodeo began as competition held in conjunction with Mandan's community fair first held on July 5, 1879. Events included pony races, a baseball game and a showcasing of area rancher's roping skills. A newspaper article in 1882 was the first publication which formally identified a rodeo as part of the event. Some years, only animal related competition mentioned in newspaper accounts was the horse race. In the early 1890s, the two highlights of the day's celebration was the parade and the baseball game. Children's games and shooting contests are also frequently mentioned. 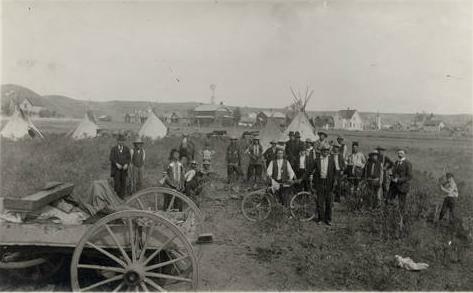 The Dakota Territorial Legislature approved an act on April 25, 1885, signed by Governor Pierce, to create a Board of Agriculture for the purpose of “forwarding the interests of agriculture, horticulture, manufacturing, and domestic arts.” The principal function of the Board was to organize and maintain an annual exhibition of the products of the territory in agriculture, stock raising, and other lines to be known as the “Annual Territorial Fair.” The site of the Fair was not designated, and there was keen competition among the larger towns of the territory. Mandan hosted North Dakota’s first ever State Fair, beginning in 1897. 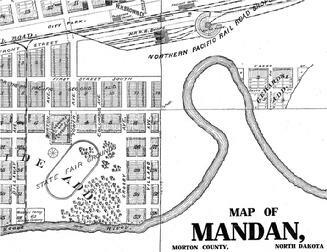 From 1897 to 1905, Mandan continued to host the fair, operated with $1,250 from the State Legislature. During the 1920s, four cities in the state claimed to host the State Fair, including Minot which held its first event in 1922. Even after the event lost its official "State Fair" designation, annual celebrations continued at the fairgrounds as the Missouri Slope Fair until it was discontinued in 1932. The Morton County Fair Association was incorporated in July 1895 with George Harmon as president, A. E. Thorberg, vice-president and C. L. Timmerman as secretary. Articles of incorporation were prepared by T. C. Kennelly, W. S. Barrows and Elijah Boley. Plans made for a fall fair that year at the Heart River fairgrounds in southwest Mandan between the Heart River and Main Street. The property was reportedly donated by members of the Boston Syndicate with the stipulation that a fair be held each year. The site was prepared by enclosing it with an fence and installing an oval track with a layer of clay over one of sand. The work was completed by 16 teams of volunteers with a total of $400 being allowed for the entire track. Subscriptions totaling $2225 were collected. Invitations were sent to area clergymen, ND Stock Growers Association, and the Wool Growers Association. Letters containing tags for grain exhibits were mailed to farmers. The Dickinson band was procured and ND Governor Allin was the guest speaker at opening day ceremonies. About two dozen Mandan men and women were named superintendents of various exhibit departments. Scores of prizes were awarded for grain and vegetable exhibits, horses, cattle and swine exhibits for various horse races, and in the women's depart for jellies, cakes, crocheting and associated handiwork, carpet weaving, oil and water paintings, painted chinaware, flowers and dried floral exhibits among others. Unique was the baby department in which prizes were awarded for heaviest baby, prettiest daughter, prettiest hair and eyes, best natured baby, sweetest smile and best all around baby. Prizes were typically donated by local businesses. The Fair was successful both financially and in terms of regional participation. Receipts totaled $4181 and covered its expenses. The Fair features roping and horse racing events. 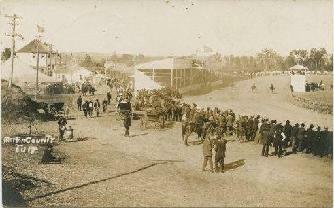 The 1904 North Dakota State Fair and was the last which permitted the roping of big range steers. As vice-president of the State Fair Association and prominent horse rancher from Flasher, Stephen P. Weekes was instrumental in the event�s development, along with his sons, Steve and Charlie. Weeke's son-in-law, Max Theil, created the "Heart River Roundup" in about 1918 and �Badlands Bill� McCarty joined the association and promoted the moniker "Mandan Roundup" starting in 1923. During the Depression, the rodeo was temporarily suspended. However in 1938-39, the rodeo grounds in southwest part of the city were rebuilt as a Citizen Conservation Corps (CCC) project. In 1940, en effort spearheaded by Col. A.B. Welch to resume the staging the rodeo. In 1941 and 1942, Leo J. Cramer staged the shows. 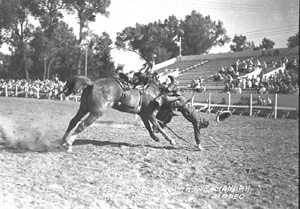 During the late 1940s, the Mandan Rodeo Association, headed by Frank Wetzstein, organized high-class productions where top cowboys like Toots Mansfield, Gene Ross and Casey Tibbs competed and celebrities like Gene Autry and Rex Allen performed. In 1942, Fred Kist Sr. leased a small portion of the the Morton County Fairgrounds to begin a small livestock auction and continued operation there until 1956 when he moved his operation to larger facilities. However the animal chutes, pens and some small buildings were left behind which continued as support facilities for the fair and other activities. The Mandan Rodeo became famous as part of the �big loop� that included the Cheyenne Frontier Days and the Calgary Stampede. The three regional events allowed cowboys to go from rodeo to rodeo winning money in what�s referred to as �Cowboy Christmas� around Independance Day.<?xml:namespace prefix = o ns = "urn:schemas-microsoft-com:office:office" /> Many rodeo competitors also compete at the rodeo held at Mobridge, SD which is typically held on the same weekend. General aviation aircraft shuttle competitors between the two cities, especially when the schedule is tight. In 1951, 11,000 people attended the 4th of July Mandan Rodeo performance, where stock was provided by Leo Cremer of Big Timber, Montana, and J.C. Stevenson, Carson. The Mandan American Legion took over the rodeo in 1954 and promoted it as "The Biggest Fourth of July Show in the US." �Stock was provided by Buetler-Morgan of Elk City, Oklahoma, and the prize money was increased to $4,500. 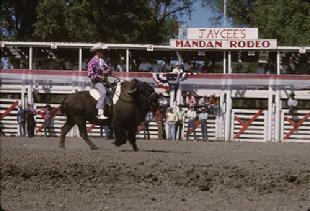 By the mid-1980s, the�grandstand at the Syndicate/Heart River�area rodeo grounds started to show its age.��The year 1989 marked the last performance of the�Mandan Rodeo at the old rodeo grounds, capping off�North Dakota�s centennial festivities.� The Mandan Park District built a new facility named Dacotah Centennial�Park, just off Memorial Highway - aka�"the Strip" - in southeast Mandan. The event was honored by the ND Cowboy Hall of Fame with its�2006 Special Achievement award.